Real estate conveyances in Kansas are governed by Chapter 58, Section 22 of the Kansas Statutes, but the statutes do not specifically address grant deeds. 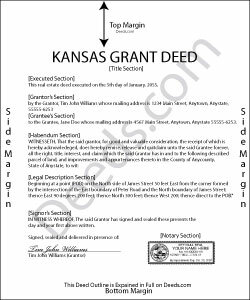 A grant deed is a legal document used to transfer, or convey, rights in real property from a grantor (seller) to a grantee (buyer). A recorded grant deed imparts notice of this transfer to all persons, including subsequent purchasers or mortgagees (K.S.A. 58-2222). Within the deed are covenants, or guarantees, that the grantor has not previously sold the real property interest now being conveyed to the grantee, and that the property is being conveyed to the grantee without any liens or encumbrances, except for those specifically disclosed in the deed. Grant deeds do not generally require the grantor to defend title claims. A lawful grant deed includes the grantor's full name and marital status, as well as the grantee's full name, marital status, mailing address, and vesting. Vesting describes how the grantee holds title to the property. For Kansas residential property, the primary methods for holding title in co-ownership are tenancy in common and joint tenancy. A grant of ownership of real estate to two or more persons is presumed to create a tenancy in common, unless otherwise stated (K.S.A. 58-501). All deeds must be signed by the grantor, or by the party's lawful agent or attorney, and may be acknowledged or proved and certified in the manner prescribed by the Uniform Law on Notarial Acts (K.S.A. 58-2209). The State Property Valuation Department requires a Real Estate Sales Validation Questionnaire with each deed unless it meets one of the exemptions provided in K.S.A. 79-1437e. Include the amount of consideration exchanged on the form (K.S.A. 79-1437g). Submit the deed and any required supplemental documents for recording in the county where the property is located. In most cases, the deed will be returned to the grantee after recording. The register of deeds will forward the information to the county clerk, who will update records for mailing tax statements (K.S.A. 58-2221). Record the deed in the appropriate county to provide notice to third parties (K.S.A. 58-2223). This article is provided for informational purposes only and is not a substitute for legal advice. Contact a lawyer with questions about limited warranty deeds or for any other issues related to the transfer of real property in Kansas. Jeffey V. said: Easiest way I've found to get Warranty Deeds in different parts of the country. Highly recommend. Reply from Staff: Thank you Jeffey.